East Bay Green Tours offers custom guided tours to supplement class curriculums. If only more schools could afford it. High school kids learn about recycling. A bright yellow bus rolls up shortly after 9 a.m. to pick up ten Berkeley High students waiting at the curb. As the sophomores board and file straight to the rear three rows, flirtatious teenage chatter fills the bus. It's a field trip, after all. Yet this is no ordinary excursion, and the students may not realize just how lucky they are. Seated up front is the infectiously upbeat Salem Kimble, an employee of Berkeley non-profit East Bay Green Tours and today's tour guide. Through an arrangement with the school, East Bay Green Tours devised and coordinated the entire trip, and once everyone is situated, Kimble delivers a brief introduction. 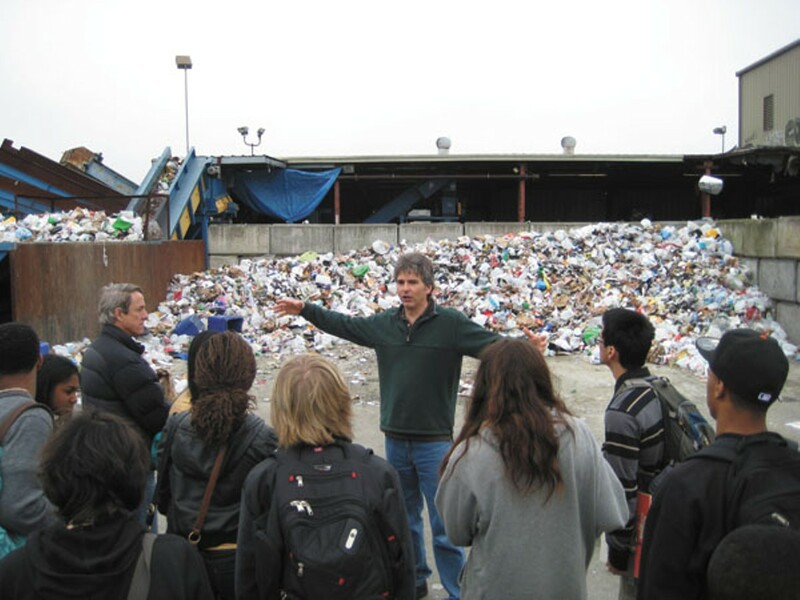 Today's tour, titled "Rethinking Waste," will visit sites that address waste-stream diversion through reuse, as opposed to recycling, in the cities of Berkeley, Oakland, Emeryville, and Albany. The topic should be familiar to the students; as members of the School for Social Justice and Ecology at Berkeley High, they've been learning about the "four r's" (reduce, reuse, recycle, rot) all semester in Kate Trimlett's Introduction to Environmental Science class. And by the time the tour reaches the first stop — a pair of businesses in East Oakland that sell salvaged residential building and construction supplies — it's clear that the subject matter is sinking in. "That was fun!" one student proclaims as she bounds up the stairs to the bus. Later, after visiting the acrid Emeryville warehouse of BTTR Ventures, which reuses coffee grounds to grow mushrooms, another student gushes, "That's cool, I wanna work there." As appropriate as it is to their curriculum at Berkeley High, the opportunity to witness reuse in action didn't come easy. Instead, it's the result of fortuitous circumstances and a fortunate funding source, without which these students would likely be learning about the topic from their desks back at school. East Bay Green Tours came together in late 2008. Executive Director Melissa LaMagna conceived of the tours as a way of showing off the East Bay's emerging green corridor. "I'm just putting a spotlight on the pioneers in our area, so everyone can learn about them," she said. "Even for me personally, I'm constantly learning." Although LaMagna says she's received support from a number of local businesses and organizations, the enterprise hasn't been financially sustainable. So in late 2009 she shifted gears from monthly green corridor tours to more frequent custom tours designed to meet specific groups' needs. LaMagna and Trimlett first met in May 2009 at the opening of Berkeley's David Brower Center, where East Bay Green Tours is currently housed. They hit it off, and by September were discussing the logistics of designing one tour to match each of the six teaching units Trimlett had prepared for her new class over the summer. Trimlett had already planned on organizing field trips, so the partnership was ideal. Except for one hurdle: funding. East Bay Green Tours charges between $1,100 and $3,000 per group tour, depending on bus selection and tour length and locations. The cost for a full-day tour per head is usually about $90. Berkeley High wasn't going to foot the bill, so Trimlett applied for a special grant from the California Partnership Academies. As a "small school" within Berkeley High's larger structure, the School of Social Justice and Ecology is already dependent upon academy funding. But Trimlett was able to secure additional funding to cover a total of seven trips at $40 a student. East Bay Green Tours agreed to cut its price nearly in half to $50 per person, leaving students to pay the final $10. But with a second Introduction to Environmental Science class taking each tour in conjunction with Trimlett's group, the school needs funding for at least five trips per class, but they currently only have enough for three each. Planned tours on water and food may have to be cancelled if Trimlett can't find another financial partner. Even if that happens, she's been fortunate to get this far. East Bay Green Tours has also provided tours to students at Contra Costa Community College in San Pablo, West County Community High School in Richmond, and Portola Middle School in El Cerrito. Each has hinged on securing one-time funding from beyond school walls, and none of the schools have established a consistent stream to support repeat trips. LaMagna said many other local schools, including Oakland Technical High School's Green Academy, have expressed interest, but haven't been able to find the money. Given the state of public education spending in California, custom field trips such as those offered by East Bay Green Tours are likely to remain a luxury item. But based on her experience this semester, Trimlett is convinced they're worthwhile. She's noticed that the tours lead not only to improved test scores, but also to greater enjoyment of the subject matter — even back in the classroom. "We're able to spark interest in most of our students from the tours," she said. "It's been really rewarding."